But I don’t want to be. I want to be on a covenant. Well, more accurately: I want to want to be on a covenant. But I’m on a diet. I decided to do a little Daniel Fast for a few weeks until my brother’s thirtieth birthday weekend. But really, I’m gonna be honest with ya. It was just cause I wanted to lose some more weight. It had nothing to do with God other than I picked a “diet” from the bible. I mean, don’t get me wrong, I still think he’s telling me to “go back to the beginning” like I mentioned on Day 464: Out Of Options and I still think that eating a Daniel Fast-type-diet is the way to go for me… it’s just that I’m having some difficulty standing by it cause it was more about ME and so not about HIM. If it were about Him, I’d like to think that I’d been relentless about not eating meat, about not eating bread, about eating fruit and veggies, about going to the grocery store to get some real food supplies, about cooking Daniel Fast meals. But relentless, I have not been. And I’m not here to beat myself up. I’m here to lay it out there. Cause I’m on a journey. And a journey has a lot of deviations from the path. I’m still heading in the right direction, but sometimes I get diverted off the highway. or I think I’m too worn out and I need a pit stop. or I’m just too. dern. tired. to go any further. So, now I realize how much I need His Power. His Spirit. His Life. Realizing that again, gets me back on that highway. It gets me focusing on The Thing that matters again. God. The Word. The Holy Spirit. The Forgiveness of Jesus Christ. The Calling to be a Blessing to the World. 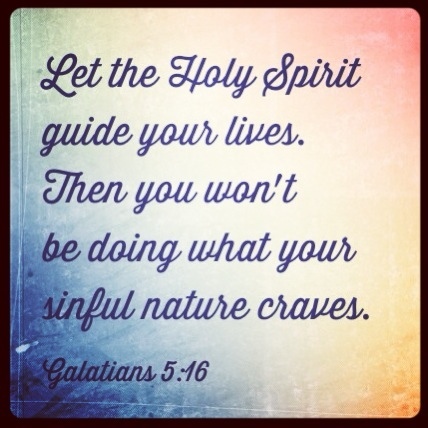 So, Holy Spirit… guide my life. I don’t want to do what my sinful nature craves. Guide my life. Guide me. Guide my mind. Guide my actions. Guide my thoughts, my hopes, my fears. Guide me to God. I haven’t wanted fruit the past week. Like… at. all. Veggies? Nope. Not so much. And I have this sort of… numb… feeling about honoring God right now. Pretty sure that it is an aftermath of not reading the bible religiously (i.e. habitually) and not really praying for a couple of weeks. But nonetheless, gotta get my focus back. I need to care about honoring God. I mean it’s not that I’m breaking the covenant (although I got realllllllll close to that line this morning when I made the boys “Cookie Dough Soup”… essentially oatmeal with brown sugar and chocolate chips… and Saxon didn’t want his and I was super hungry so I ate “around” the chocolate chips… ya know, the ones that had melted making it virtually impossible to eat “around” them), but I’m not at all worried about making choices that please Him, or choices that are beneficial, or eating to live instead of living to eat. Well, I’m feeling a bit like I’m back in the saddle again. Throwing out the scale was huge, and being reminded by God that He WILL continue His covenant with me… well, both of those things somehow managed to get my sights back on track. Over the past couple of days, it has been relatively easy to eat what I should eat… fruits, veggies, nuts. And I can definitively say that it has not be “easy” to eat what is beneficial (instead of what is “okay” like tortillas, potato chips, feta cheese, etc.) since I finished with my Lent fast. I had a bit of “backlash” from not being able to eat those things for so long that it was all I wanted at first, and since in January I’ll be “released” from the covenant and able to eat whatever I want, it was good to know that it lasted a while… a month pretty much, before I started to feel like something was “off”. And even without the scale telling me that something was wrong, I knew that something was “off”. I can’t really explain it, but eating all of that stuff was just… dissatisfying. Turns out, food just tastes like… food. Really all of it either fits on the “ick” end of the spectrum of taste or it fits on the “delish” end or somewhere in between. But, really… honestly… nothing really goes beyond “delish”. It’s like my tastebuds max out on a delish signal to the brain and that’s it. Nothing really tastes “super extra amazingly delish”. I think what tricked me into believing that this existed before was because of the emotional connection that I was attaching to the foods as I was eating them. And that list could keep going I’m sure, but what it boils down to is that I’m learning “the truth” about food. I’m learning over and over again that it really isn’t a good comforter. or companion. or whatever else it is that I have made it. And even more dissatisfying was knowing each time that I was not honoring God with my choices. Yes, again, I was sticking with the covenant but I was sort of ignoring making my food choices as something that would honor Him and was focusing on myself and my “needs“. And honestly, not honoring God leaves a really bad taste in my mouth. in my heart. And, well, ultimately, I am dissatisfied. But now that I desire for my eating to honor Him again, it’s like… well, everything is satisfying. My taste buds, my stomach, my heart, my mind, my life. So, really… I think that I have discovered that my God is really the only thing that is, truly, super extra amazingly delish! I have thirteen more days after today to be on my Lent fast of fruits, veggies, and nuts. It has been far easier than I expected as well as extremely eye opening as to how much processed foods I consume even on my regular Daniel Fast. Having said that, I miss cheese, eggs, and fish! I mean… I miss the pasta and beans and rice and bread, too, but I only miss them because of the convenience of them in recipes, like spaghetti and pasta, stuffed bell peppers with rice, carribean style beans, and veggie enchiladas and tacos… ooooo, and a mushroom burger!!! But all of those things I could take them or leave them, but I want a veggie omelet, a baked potato with cheese, a panko crusted tilapia filet! I don’t want another orange. I don’t want another apple. I don’t want another raisin. Honestly, I don’t think this way that all the time! But there are times when I look in the fridge for breakfast and get a little discouraged when it looks like I’ll be having yet another clementine. But most of the time I just grab whatever is on my fast to eat and just go forward from there which is a good sign, I think, that I’m moving away from food as a lust into food as a nourishment. But, I do think about how the Israelites felt with manna everyday. I mean, I may not have as much variety as a non-faster has, but I have way more variety than manna for breakfast, manna for lunch, and manna for dinner. But I guess in a way I do have manna for every meal. I mean, God provided more than just manna during those “drop feeds”. And this is exactly the same learning that I am having to go through. I probably would have been one of those Israelites that gathered up extra only to find it had turned to rot with maggots in it. Actually, I have been that Israelite. I have eaten more than what I need and the result was that I had an addiction to that “more”… a rotten, maggot-infested pile of “more”. of an overweight body. of an overweight soul. But just like those Isreaelites that learned the hard way didn’t make the same decision again, I have handed over my pile of “more”… my extra… my excess. And in return, God has given me as much as I need. And it will feed me perfectly, well, for at least the 40 years it fed the Israelites!